Catastrophes that have occurred in and around Staten Island will be explored. These will include the sinking of the Mohawk yacht (1876), the Westfield ferry explosion (1871), the New Street building collapse during the Great Depression, the mid-air plane collision over New Dorp (1960), the LNG tank explosion, the crash of the Sea Witch and Esso Brussels, and various ferryboat accidents. Irish and Irish-American scholars, rebels, educators, politicians and the legacies they left will be featured. 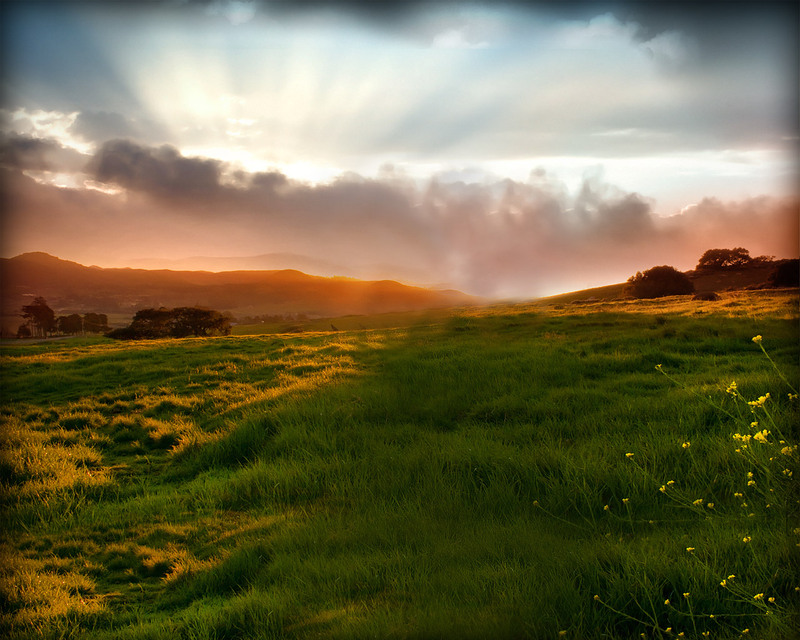 Important events in Irish-American history that relate to the borough, such as “The Great Hunger,” Irish immigration, and the 19th century Quarantine Stations, will be included. The Saint George, Ritz, Paramount, Palace, Stadium, Liberty, and Empire Theatres will be celebrated. (Don’t forget the Drive-In!) Movies made in the borough such as “The Godfather I and II, Working Girls, Goodfellas, Two Family House, School of Rock, Kinsey” and others will be discussed. Only checks and credit cards will be accepted for payment at the time of the program. Make checks payable to the Tottenville Historical Society. ADVANCE REGISTRATION IS REQUIRED. Write to Pat@PatSalmonHistory.com All programs take place at the historic Henry Hogg Biddle House, 70 Satterlee Street, Conference House Park, Staten Island. Join me for Celebrating the Italians of Staten Island! at the Biddle House, 70 Satterlee Street, Conference House Park on Saturday, November 24 at 2 pm, $7. Advance registration is required. This is an important fundraiser for the Tottenville Historical Society. See you then! 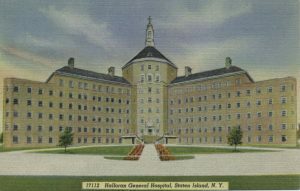 Haunted Tales of Old Staten Island with Staten Island OutLOUD, Friday, October 26, 7pm, Conference House. Free! Some of Staten Island’s most noted historians have documented stories of spirits in the borough. We will recount these tales in the ancient basement of the Conference House—which is actually the site of one supernatural account! Snug Harbor ghosts, the Haunted Swamp in Grasmere and apparitions who have manifested themselves at Prince’s Bay will be featured. The opening of the Verrazano-Narrows Bridge was the most important event in Staten Island’s history. The lack of preparation before “The Bridge” opened has been felt for the last fifty years. We will look at the forces that shaped the island as a result of this controversial connection. The transportation empire started by Cornelius Vanderbilt began on Staten Island. Eventually, his son took over with the result that he became the richest man in the world. Both men were passionate about succeeding. 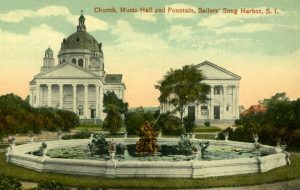 Their legacy and connections will be discussed while examining the family lineage, their local properties and homes, the Vanderbilt Mausoleum, and more. The Staten Island Ferry: A History, National Lighthouse Museum, Thursday, November 8, 6:30pm, $10/$5 members. Museum entrance parking. Borough Class Staten Island ferryboat. Join me for a discussion on this floating New York City icon. The ferry run we know today, ferryboats and their classes, the St. George and Whitehall terminals, ferry calamities, and those individuals who have molded the story of the Staten Island Ferry over the years will be featured. 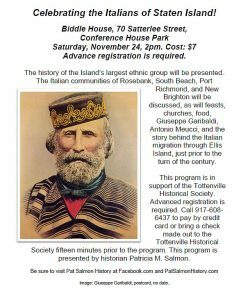 The history of Staten Island’s largest ethnic group will be presented as we look at the Italian communities of Rosebank, South Beach, Port Richmond, and New Brighton, feasts, religious institutions, food, Giuseppe Garibaldi, Antonio Meucci, and much more. The story behind the Italian migration just prior to the turn of the century will also be included, along with factual information on the Ellis Island experience. 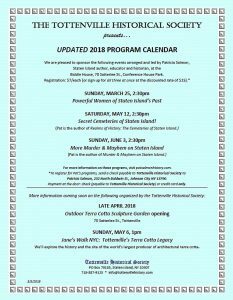 ***This program is in support of the Tottenville Historical Society. Advanced payment is required. Call 917-608-6437 to pay by credit card or mail a check to the Tottenville Historical Society, PO Box 70185, Staten Island, NY, 10307. For further information write to Pat@PatSalmonHistory.com or call 917-608-6437. All are welcome to attend “More Murder & Mayhem on Staten Island” on Sunday, June 3, 2018, at 2:30pm, at the historic Henry Hogg Biddle House. This historic landmark is located at 70 Satterlee Street in Conference House Park. The program is sponsored by and in support of the Tottenville Historical Society. The cost is $7.00. “Modern-day” homicides will be presented as will several that occurred during the 19th century. Serial killer Richard Biegenwald who used a Sharrotts Road property as a burial ground for his victims will be discussed, as will the 1958 double murder involving Dr. and Mrs. Melvin Nimer of Clifton. The latter case remains a mystery. For information write to Pat@PatSalmonHistory.com or call 917-608-6437. Join me for several special programs during March 2018! The Irish on Staten Island! Friday, March 9, 6pm, Noble Maritime Collection, Building D, Snug Harbor Cultural Center. Cost: $5. Fascinating facts and analysis on the Irish-American residents of Staten Island, including scholars, journalists, educators, politicians, rebels, rioters and others, will be featured. Important events in Irish and Irish-American history that relate to Staten Island, including Irish immigration, the nineteenth century Quarantine Stations, the Draft Riots of 1863, and more will also be discussed. A grand time will be had by all! Powerful Women of Staten Island’s Past! Saturday, March 10, 2pm, Alice Austen House. Cost: Free. Saturday, March 25, 2:30pm, Biddle House, Conference House Park, sponsored by the Tottenville Historical Society. Cost: $7. Registration is requested. Let’s celebrate and discuss the contributions of several amazing women who have impacted Staten Island. Many of these women encountered challenges, yet persevered to accomplish their goals. Such influential personalities as Eva Bechtel, Alice Austen, Mary Jane O’Donovan-Rossa, Elizabeth Gertrude Britton, Dorothy Day, Lois Mosely, Audre Lorde, “Mac” O’Callaghan, Elizabeth Connelly and others will be featured. 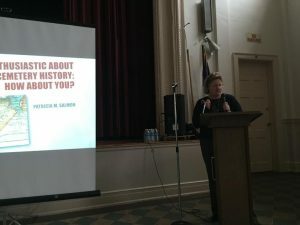 “True Grit” and the Suffragettes with Staten Island OutLOUD, Edwina Martin and the Staten Island Women’s Bar Association and Patricia Salmon. Sunday, March 11, 2pm. Court House, Historic Richmond Town. Cost: Free, plus get a free copy of “True Grit”! Mattie Ross, the fourteen-year-old heroine of True Grit, found courage to tackle an impossible task. 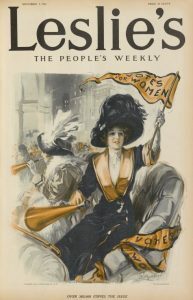 She became an adult at about the time that Suffragettes waged a dangerous campaign for a woman’s right to vote. Join us as we present the “true grit” of Staten Island and New York Suffragettes! Be sure to join my Facebook group: Pat Salmon History. See you there! Archeological Discoveries in Brewing: From the Ancients to Staten Island’s Nineteenth Century Brewery Barons! More than one murder occurred in the beach communities of the island during Prohibition. The Richmond Town Book Club is opening the doors of the Bennett Café to all who would like to attend a special talk on the book: “Staten Island: Murderers & Mysteries of the Forgotten Borough.” I will discuss several murders along with information sources, historic crime solving and Prohibition Era unlawfulness on Staten Island. The Bennett Café is located on Richmond Road in Historic Richmond Town. We begin at 7:30 pm on Wednesday, October 25. Light refreshments will be served. This is a free presentation, but please write to pat@patsalmonhistory.com if you will be joining us. 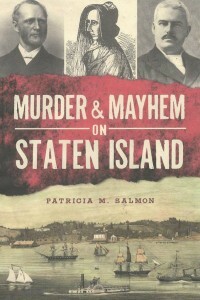 “Staten Island: Murderers & Mysteries of the Forgotten Borough, was the follow-up book to “Murder & Mayhem on Staten Island.” Each book contains twelve thoroughly researched murders and mysteries that occurred between the 1840’s and the 1930’s. These evil events took place across Staten Island. 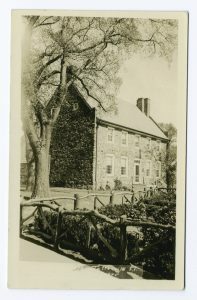 Strange events have occurred in and around Sailors’ Snug Harbor since it opened in 1833. Join me as I recount several intriguing episodes during “Mysterious Harbor” at the Noble Maritime Collection. The presentation will include the murder of Chaplain Robert Quinn at the Snug Harbor Chapel in 1863. 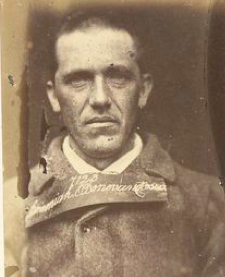 The disappearance of Mary Tobin from the nearby Livingston train station in 1889 will be featured, as will the murder of Dr. Charles W. Townsend on Westervelt Avenue. Prohibition crimes on the nearby Kill Van Kull waterfront will also be discussed. “Mysterious Harbor” would not be complete without a history of the little-known Sailors’ Snug Harbor Cemeteries. The cost for “Mysterious Harbor” is a voluntary Museum donation. 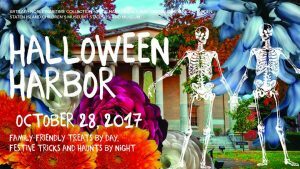 This event is part of “Halloween Harbor” at the Snug Harbor Cultural Center. Visit snug-harbor.org for details. 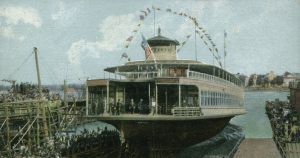 Launch of the ferryboat “Richmond,” 1905. 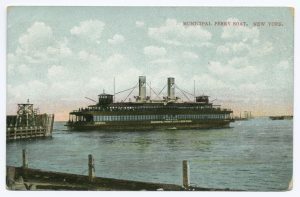 The History of Staten Island – Part 2 with Patricia M. Salmon at the Noble Maritime Collection on Thursdays, April 6, 13, 27, May 4, 11, 18, and 25, 2017 from 7 pm – 9pm. April 6, 2017 – The Vanderbilt’s: An Empire Founded on Staten Island presents Cornelius Vanderbilt and his shipping and railroad empire, and the eventual involvement and success of William H. Vanderbilt. Their Staten Island beginnings and connections including local properties, the Moravian Cemetery, the Vanderbilt Mausoleum and more will be featured. April 13 – More Murder and Mayhem on Staten Island. 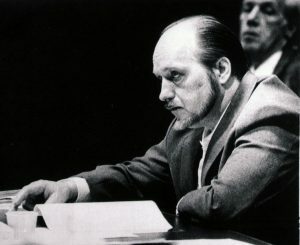 Modern day serial killers Richard Biegenwald and Richard W. Rodgers, Jr., along with other episodes and killers will be discussed. April 27 – The Powerful Women of Staten Island’s Past. Discover such influential personalities as Kate Walker, Eva Bechtel, Alice Austen, Mary Jane Irwin, Gertrude Knight Britton, Dorothy Day, Mathilde Weingartner, Lois Mosely, Elizabeth Connelly, Mamie Smith, Audre Lorde, and Catherine “Mac” O’Callaghan. May 4 – Business & Industry on Staten Island – Part 2. 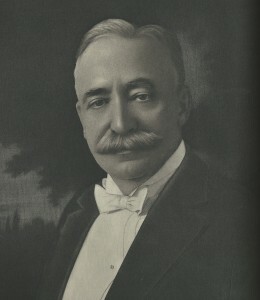 An array of products were made on the island by such concerns as J.B. King, United States Gypsum, Jewett White Lead, Dean Linseed Oil Company, Ostwald’s Uniforms, Unexcelled Fireworks, the DeJonge Paper Company and others. What was made? Who made it and where it was made will all be covered. Bucolic view of the original Samuel R. Smith Infirmary in New Brighton. Postcard, no date. May 11 – Abandoned Staten Island includes historical analysis of such neglected locations as the Farm Colony and Sea View Hospital; the Merrell, Staten Island, Fountain, and Church of the Ascension cemeteries (now administered by the Friends of Abandoned Cemeteries); the Rossville Liquefied Natural Gas (LNG) tanks; the S.R. Smith Infirmary; Shooter’s, Prall’s, Swinburne & Hoffman Islands; and the former Seaman’s Retreat (most recently referred to as Bayley Seton Hospital). 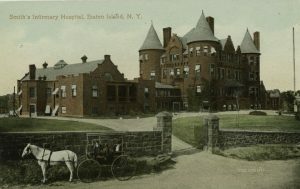 May 18 – Turrets, Towers, and More: The Historic Landmarks of Staten Island. The island is home to many amazing historic structures. We will examine such neighborhoods as Stapleton, Sandy Ground, New Brighton, and Saint George. In addition, individual buildings including Crimson Beech, the Pendleton Cottage, the Dr. Samuel M. Elliott House, the Gustave Mayer House, the Sequine Mansion, and the Sequine-Manee House will be discussed. Willowbrook State School would eventually replace Halloran General Hospital. Linen postcard, circa 1940s. May 25 – Staten Island Calamities looks at the Vanderbilt Landing bridge collapse in 1852; the sinking of the Mohawk yacht; the Westfield ferry explosion; the Northfield ferry accident in 1901; the New Street building collapse in 1937; the mid-air plane collision of 1960; the Bloomfield LNG tank explosion, and the former Willowbrook State School. Programs will include a Powerpoint, lecture, video clips, question and answer periods, sources for future research by participants, handouts, and guest speakers. To pay for the series in advance by check please make the check out to Patricia M. Salmon and mail it to 232 North Baldwin Street, Johnson City, NY 13790. Cash, credit card, or check payments will be accepted fifteen minutes prior to each program. For further information contact Patricia M. Salmon at Pat@PatSalmonHistory.com or call 917-608-6437. Please join us and feel free to pass this information along. Thank you! Tina Kaasmann-Dunn, Richard Simpson and I will share fascinating information about the Vanderbilt family and their Staten Island connections. “The Commodore” Cornelius Vanderbilt, no date. 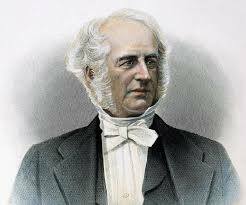 The Vanderbilt’s were one of the wealthiest families in the United States owing to the business success of Port Richmond native Cornelius Vanderbilt. The family eventually owned boats, ships, and railroads that affected transportation from the nineteenth century to today. The Vanderbilt’s went on to build mansions in Manhattan, Long Island, North Carolina and at Newport, Rhode Island. They were leaders of society in New York and abroad. Their fortune, fame, and influence began on Staten Island. For information please email Richard Simpson at cemeteryguy@earthlink.net or call 917/608-6437. Buon Giorno! Please join me for “Celebrating the Italians of Staten Island!” at the Garibaldi-Meucci Museum on Sunday, October 30th at 3:00 pm. The history of Staten Island’s largest ethnic group will be presented. Topics include the Italian communities of Rosebank, South Beach, and New Brighton, feasts, religious institutions, and food. Prominent Italians and Italian-Americans who have left their mark on the island, including Giovanni da Verrazzano, Giuseppe Garibaldi, Antonio Meucci, Senator John Marchi, and others will be featured. In addition, we will examine the story behind the massive Italian migration that took place prior to the arrival of the twentieth century. This will of course include discussion of the immigrant experience at Ellis Island. Discover the Italian contribution to Staten Island and New York City! For details call 718-442-1608 or write to me at Pat@PatSalmonHistory.com Ciao for now! Mysterious Harbor with historian Patricia M. Salmon at 6:30 pm on Thursday, October 27, 2016, at the Noble Maritime Collection, Building D, Snug Harbor Cultural Center, 1000 Richmond Terrace, Staten Island. 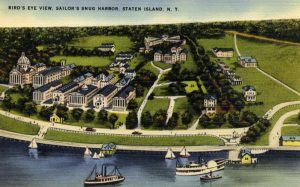 Aerial view of Sailors’ Snug Harbor, no date. Many strange events have occurred in and around what is now the Snug Harbor Cultural Center. This presentation will focus on real happenings that took place when the site was known as Sailors’ Snug Harbor. Based on true events from the books Staten Island: Murderers and Mysteries of the Forgotten Borough and Murder and Mayhem on Staten Island the author, Patricia M. Salmon, will discuss the shooting of Snug Harbor Chaplain Robert Quinn by a resident “Snug” in 1863. This will be followed by presentations on the disappearance of Mary Tobin from the Snug Harbor train station in 1889, and the murder of Westervelt Avenue resident Dr. Charles W. Townsend in 1907. The Prohibition era slaying of a night watchman safeguarding legal booze in a Richmond Terrace warehouse in 1922 will also be featured. This program is FREE of charge and geared for adults. For further information, please write to Pat@PatSalmonHistory.com or call 917/608-6437. The Noble Maritime Collection can be reached by calling 718/447-6490. Please visit their website at noblemaritime.org to learn more about this unique cultural gem. 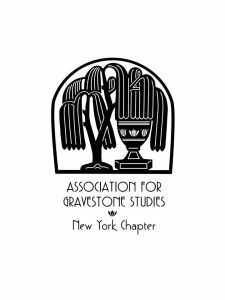 A few pictures from the Fall Meeting of the New York Chapter of the Association for Gravestone Studies held at Moravian Cemetery on Saturday, September 24, 2016. What an informative event. I look forward to next year! Group photo on the steps of the New Dorp Moravian Church Parish Hall, Saturday, September 24, 2016. 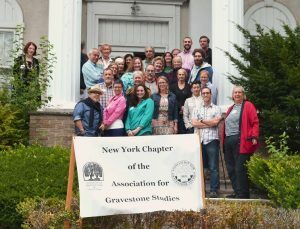 Patricia Salmon presenting “We Are Enthusiastic About Cemetery History: How About You?.” Courtesy of the NY Chapter-Association for Gravestone Studies. We Are Enthusiastic About Cemetery History, How About You? Brooke Young, Architectural Conservator, EverGreene Architectural Arts and R. Mark Adams, Inc. Cemetery walking tour led by Richard Simpson (the tour costs $5). Maps will be provided for those taking a self-guided visit instead of or after the tour. RSVPs are required. Please email to evabowerman25@gmail.com. 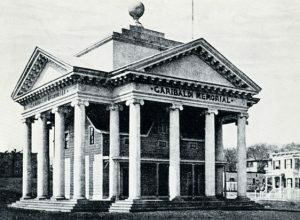 The usually placid Sailors’ Snug Harbor was the scene of a fatal shooting in 1863. It will be one of the crimes discussed on June 25, 2016. These and other murders and mysteries will be presented at 2 p.m. during the free presentation Murder and Mayhem on Staten Island at the Pride Center of Staten Island on Saturday, June 25, 2016. This event is based on the books Murder and Mayhem on Staten Island and Staten Island: Murderers and Mysteries of the Forgotten Borough. These publications feature twenty-four murders and mysteries that occurred on Staten Island between the 1840’s and the 1930’s. The books will be for sale and can be signed the day of the event. 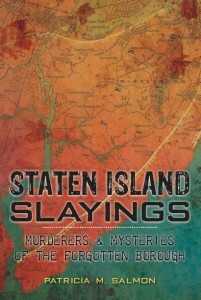 Published by The History Press, Murder and Mayhem on Staten Island was released in 2013. 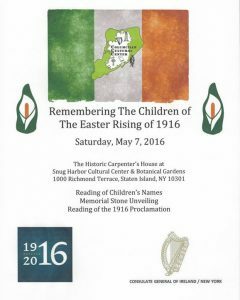 Join the Columcille Irish Cultural Center of Staten Island for a tribute to the Men and Women of “The Rising” with a multimedia display inside the historic Carpenter’s House at the Snug Harbor Cultural Center at 12 noon on Saturday, May 7, 2016. A monument dedication commemorating the forty Children who perished during the six day battle in Dublin, Ireland during Easter Week of 1916 will be held. 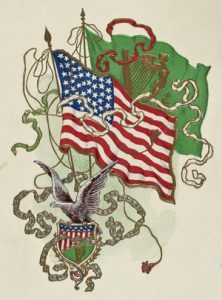 A reading of the Irish Proclamation announcing Ireland’s independence will also occur, as will performances by the Richmond County Pipes and Drums and the Staten Island Pipes and Drums. Guest Speakers include New York State Assemblyman Michael Cusick and Staten Island historian Patricia M. Salmon. 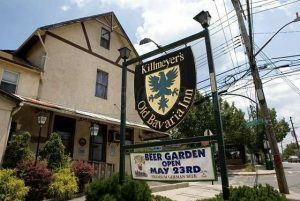 On Sunday, May 15th I have the pleasure of presenting “Staten Island’s Brewery Barons” at Killmeyer’s Old Bavaria Inn. This free event kicks off at 2:00 p.m. and is being held in conjunction with my latest book, “Staten Island’s Brewery Barons.” We will take a lively look at the German brewing tradition that began during the 1850s. 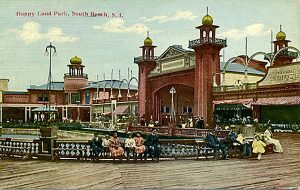 With vast numbers of German immigrants arriving in America the previous decade, a robust, new industry was formed with the result that Staten Island became a “reservoir of Teutonic Beer”! Several German brewers wisely utilized the fresh water and geology of Stapleton to perfect their brew, while another thrived at Clifton and still another flourished at Four Corners. Discover Frederick Bachmann, August Schmid, George Bechtel, Charles Bischoff, Joseph Rubsam, August Horrmann, and Monroe Eckstein—”Staten Island’s Brewery Barons”! This special event will feature a slide presentation, discussion, and reading. Signed copies of “Staten Island’s Brewery Barons” will be available for $19.99 plus tax. Killmeyer’s Old Bavaria Inn is located at the corner of Sharrotts Road and Arthur Kill Road. For further information, visit killmeyers.com or call 718/984-1202. Participants are invited to enjoy the selection of cold German beer and hearty food that is available. Displays of brewery memorabilia, from Staten Island and beyond will be on view. Cheers! 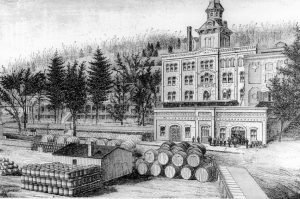 The George Bechtel Brewery in Stapleton, 1886. On Saturday, April 30, 2016, at 3:00 p.m., I will be at the Pride Center of Staten Island for a discussion on my latest book, Staten Island’s Brewery Barons! The German brewing tradition began on Staten Island during the 1850s with the result that Staten Island became a “reservoir of Teutonic Beer.” Several German brewers wisely utilized the fresh water and geology of the island to perfect their brew. Discover Frederick Bachmann, August Schmid, George Bechtel, Charles Bischoff, Joseph Rubsam, August Horrmann, and Monroe Eckstein—Staten Island’s Brewery Barons! A slide presentation, discussion, and reading by the author will be featured. 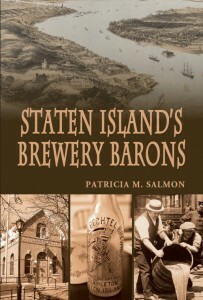 Signed copies of Staten Island’s Brewery Barons will be available for $19.99 plus tax. Mark your calendars for Historic Movie Theatres/Movies Made on Staten Island on Saturday, May 28, 2016, at 3:00 p.m. Learn about the making of The Godfather Parts I and II, Working Girl, Splendor in the Grass, Goodfellas, and even silent movies on Staten Island during this informative program, which will also focus on the magnificent movie theatres that were once found in our borough. Our trio of Staten Island Pride Center programs continues on Saturday, June 25, 2016, with Murder and Mayhem on Staten Island. An in-depth look at murder mysteries that baffled the island between the 1840s and the 1930s will be featured. For further information on these and other events please write to Pat@PatSalmonHistory.com The Pride Center of Staten Island can be reached at 718-808-1360. Also be sure to visit pridecentersi.org and patsalmonhistory.com The Pride Center of Staten Island is located at 25 Victory Boulevard, near Bay Street. 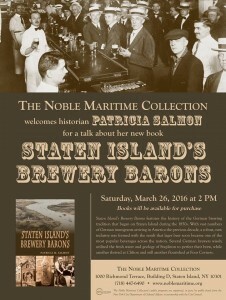 Please join me for a lively look at my new book: Staten Island’s Brewery Barons. This event will feature live music, a slide show and book presentation, and light refreshments. We will kick off at at 2:00 p.m. on March 26, 2016, at the Noble Maritime Collection. Staten Island’s Brewery Barons traces the history of the German brewing tradition that began on Staten Island during the 1850’s. With vast numbers of German immigrants arriving in America the previous decade, a robust, new industry was formed, with the result that lager beer soon became one of the most popular beverages consumed by the public. Several German brewers wisely utilized the fresh water and geology of Stapleton to perfect their brew, while another thrived at Clifton and still another flourished at Four Corners. Discover Frederick Bachmann, August Schmid, George Bechtel, Charles Bischoff, Joseph Rubsam, August Horrmann, and Monroe Eckstein—Staten Island’s Brewery Barons! To RSVP or for further information, please e-mail me at Pat@PatSalmonHistory.com or call 917-608-6437. Signed copies of Staten Island’s Brewery Barons will be sold for $19.99 plus tax. Appointments for Staten Island’s Brewery Barons speaking engagements are available. The Noble Maritime Collection is located in Building D at the Snug Harbor Cultural Center, 1000 Richmond Terrace. For details telephone 718-447-6490. Also note I will be having a book talk and presentation at the Flagship Brewery Company on Sunday, April 10, 2016, at 2:00 p.m. The brewery is located at 40 Minthorne Street, off Bay Street, east of Victory Boulevard in Tompkinsville, Staten Island. Both events are free of charge. Join us as we celebrate Irish Heritage Month at the College of Staten Island’s Center for the Arts on Thursday, March 10, at 2:30 p.m.! The festivities will kick off with traditional Irish music presented by Linda Hickman and Doug Barr. This will be followed by a lively presentation on Staten Island’s Irish-American personalities and local history events by Patricia M. Salmon. Our special afternoon will conclude with an Irish dance performance by Halle from the Forest Haven Center for Dance and Music. This unique celebration is free thanks to the Pluralism and Diversity Program of the College of Staten Island. A grand time will be had by all! The College of Staten Island is located at 2800 Victory Boulevard. Bus service from the college’s parking lots is available. To use the campus bus please call Oncampus Transportation at 718-982-2000 ext. 3220 at least 24 hours before the presentation. Office hours are Monday through Friday from 9:00 a.m. until 4:00 p.m. A small fee applies. For further information on our Irish Heritage Month celebration please write to Pat@PatSalmonHistory.com or call 917-608-6437. Soon to be released: Staten Island’s Brewery Barons! A new book by Patricia M. Salmon features the history of the German brewing tradition that began on Staten Island during the 1850s. With vast numbers of German immigrants arriving in America the previous decade, a robust, new industry was formed with the result that lager beer soon became one of the most popular beverages across the nation.